My favorite was #2. Never seen a Chukka boot quite like it! 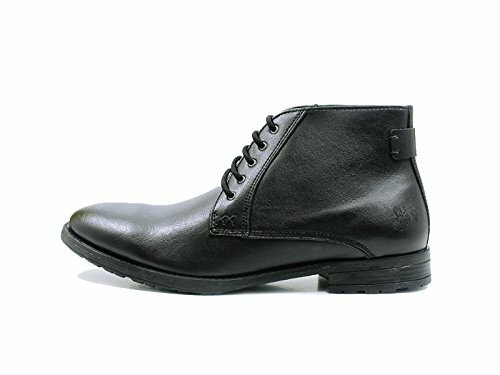 Men's dapper chukka boot in black faux leather. Made with a high-quality, environmentally-friendly design in Portugal. Appears to have a stacked rubber heel that should provide good traction. Lace-up front with stitching details below the laces. Cushioned insole for lots of support. 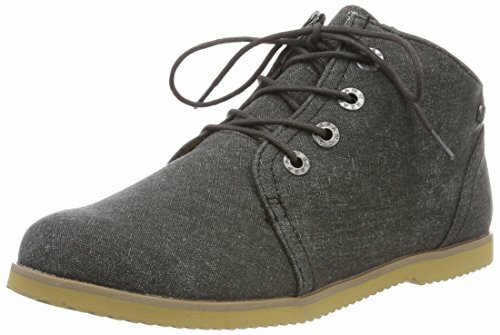 Pros: Great vegan shoes for professional or special occasions. The classic look of these boots can go with anything from a suit to simple khaki pants. The natural water resistance of the vegan leather means you won't have to dodge a few droplets if you get caught in a drizzle. Cons: Pretty pricey — definitely an investment. Women's soft velvet chukka boot with a bohemian paisley pattern in copper and rust tones against a black background. Secured with black laces with cute little tassels at the ends. Has a low black platform heel with white stitching around the outsole. Footbed has light padding to give your foot some cushion. Pros: Adorable and unique boots that are sure to fetch complements wherever you go. Wear with black leggings or a simple dress to show off their distinctive design. Comfy enough for all-day wear. Cons: Some reviewers found them to be a little rigid at the ankles. 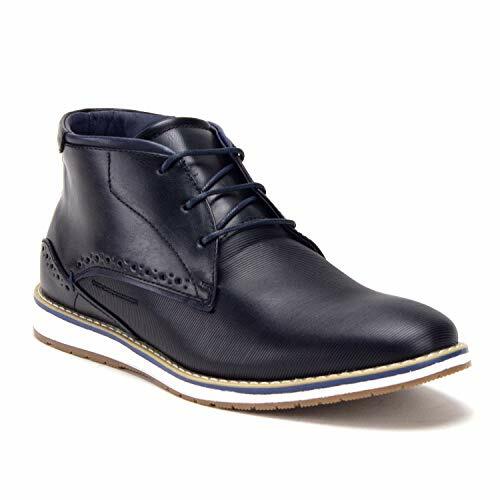 Men's sneaker style faux leather chukka boot in deep blue with brown plaid lining. Made with contrasting brown laces, tongue, pull tab and accents at the back of the boot. Has a brown and white rubber sole for a smart look and steadiness on the ground. Pros: In addition to being eco-friendly, these boots make for excellent casual wear if you're looking for a comfortable, everyday type of shoe with a little pizzazz. Perfect boots to wear with jeans and a t-shirt. Cons: Some people try to size up to work around the narrow fit. Probably not weatherproofed. 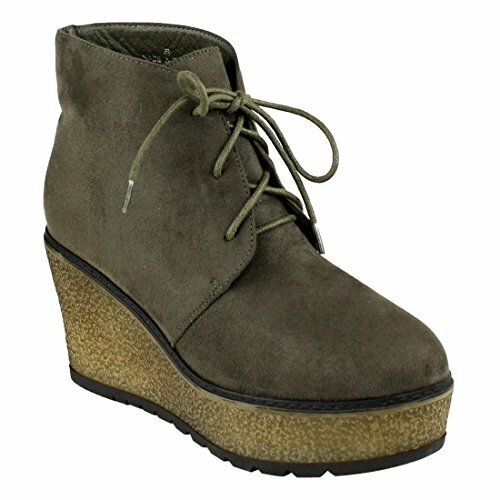 Women's olive faux suede chukka ankle boot with a lace-up front. Sports a trendy 3.25" wedge heel. Has a beige synthetic cork-like platform sole with stylish black trim. Outsole has extra traction for a good grip on the ground. Advertised as vegan: No, but the materials listed are faux suede and synthetic. Pros: Highly fashionable as wedges are very much in style. Throw these on with a pair of ankle jeans and a knotted tee for an easy dress/casual ensemble or a boxy dress if you're going for a street style look. Bonus: they're inexpensive. Cons: May run a half size small. 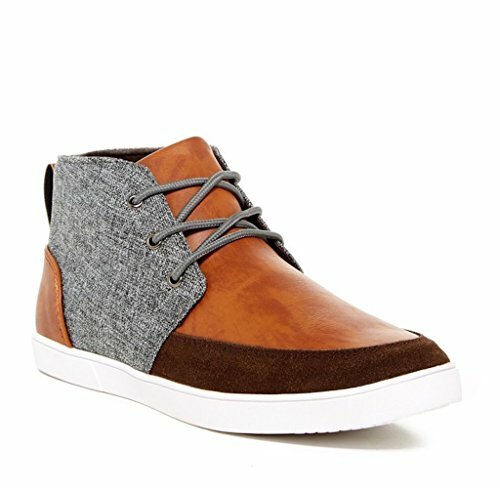 Men's chukka boot with contrasting gray crosshatch textile and brown pleather body. Has gray nylon laces and a brown pleather heel with a pull tab. Features dark brown faux suede trim around a white rubber sole. Removable padded insole makes for easy cleaning on the inside. Pros: Super stylish chukkas that can be rocked with dark wash jeans or any number of fabrics. They can be dressed up or down. Cons: Reviewers find the soles a little thin. Women's white chukka boot that laces up in the front and has a cool camo-like interior. Tan color rubber sole gives shock absorption and stability. With a memory foam insole, this boot will hug your foot. Ankle height with a pull tab to hold while your put the boot on. Pros: Extra comfortable due to the memory foam. Very simple and sophisticated — these boots would complement any color outfit and can be dressed up or down. Cons: May run a little narrow or small. Men's black melange woven fabric chukka with a brown pull tab at the back to add a subtle splash of color. Features moc toe stitching with matching black thread and black laces. Brown rubber sole is durable and super grippy. Offers sustained, breathable comfort with a molded footbed. Pros: Simple, breezy fashion that'll work with khakis, jeans, light colors, dark colors, you name it. If you work in a casual environment and are on your feet all day, these boots meet both comfort and style demands. Cons: Tom's boots will stretch a little as you break them in, which is only a con if the they're initially pretty stiff and tight. Women's heather brown chukka-style hiking boot with a tan color synthetic leather heel. Wraparound red laces secure the boot for a snug fit. Constructed with a heat-sensitive, heavy-duty rubber sole that will give good traction in wet or dry conditions. OrthoLite Rebound footbed deters moisture to keep the foot comfortably dry. Quilted lining provides warmth and softness. Advertised as vegan: No. This heathered version of the Ballard Lace II boot is all synthetic and fabric. Pros: The boots are light, comfortable and attractive, not heavy or clunky like a lot of other hiking boots. No need to even hike in them. Wear them as you would casual shoes with jeans and flannel. Cons: No mention of waterproofing, though it could have simply been left off the description. They're costly, too. Men's dress-casual chukka boot in brown. Has smooth synthetic material on the back half and textured material on the front half to give the boot a little something extra. Provides a close fit with black laces. Snazzy perforated detailing on the sides of the boot. White rubber outsole and padded insole give lots of cushion. Advertised as vegan: Yes: "100% vegan materials." Pros: Elegant appearance that isn't so dressy that you can't wear these boots with an everyday outfit. Would make for a dashing ensemble with a cable knit sweater and heavy fabric pants. Won't hurt your pockets, either. Cons: None that we're aware of. 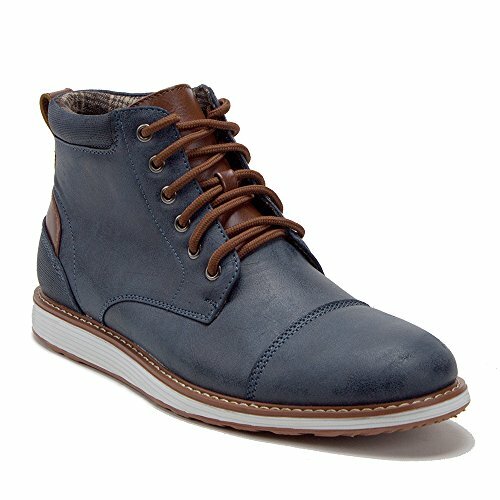 Women's blue chambray canvas chukka boot that sits at the ankle. Comes with matching blue laces you can tie as tightly or loosely as you want. Has a flexible sole, which is good for physical activity. Interior padding and arch support ensures comfort with extended wear. Advertised as vegan: No, but these boots are described as textile with synthetic soles. Pros: Nice and light so your feet won't feel like they're dragging. Wearable with a skirt for a sportier look. Cons: Not the most durable boots. Best use is for light activity and walking in warm seasons.